The tweet was sent from an iPhone, but it’s not clear if Trump sent the tweet himself or if it was sent by one of his aides. While this is hardly the first time Trump has been critical of The New York Times’ reporting about him, eagle-eyed Twitter users quickly noticed something about the tweet itself: It was sent from an iPhone. The Twitter app itself doesn’t reveal the platform a tweet was sent on, but the social network’s TweetDeck app does, which is how many discovered the tweet was sent from an iPhone. 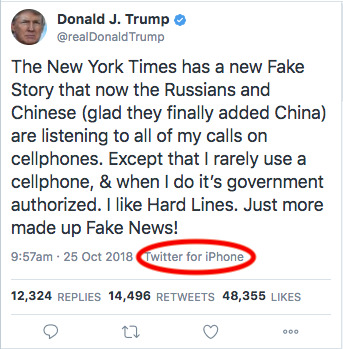 But it’s not airtight proof the president himself sent the tweet from an iPhone he was using – he could have, but his aides also have access to his Twitter account and often post for him. The Times reported that Trump’s use of his iPhones to speak with friends allows Chinese and Russian spies to listen in on his calls to get an idea of what types of arguments are successful with the president and who he trusts. The ability to compromise Trump’s calls isn’t a flaw of the iPhones themselves, but rather a security issue stemming from cellular networks. The Times also stated that Trump has two iPhones: one for Twitter and other basic web apps, and one for making phone calls.